Boynton is back! Joining Barnyard Dance! and Birthday Monsters!, here is Hey! Wake Up! 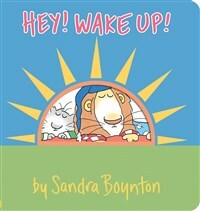 a good-morning book with the irrepressible language, the inimitable illustrations, the irresistible cast of characters only Sandra Boynton could create.